Perfecting the Whisky Glass - Norlan | Valet. Blending design and science for the ideal whisky drinking experience. A great whisky doesn't just happen by accident. It's produced by experienced craftsmen, using time-honored techniques. It's distilled, aged for years and then carefully bottled. So to simply tip a glug or two into a plain glass seems a bit careless. Besides, when you shell out for the good stuff you want to make sure you enjoy it, don't you? This is what the designers of the new Norlan glass were thinking when they decided to create the perfect glass for enjoying whisky. They incorporated design cues from two of the most common ways of consuming the brown spirit—a classic snifter and your standard rocks glass tumbler. They then fused the best attributes from both. The snifter, for example, maximizes spirit surface area and channels aromatics upwards while a standard tumbler is easier to drink from and feels more substantial in the hand. 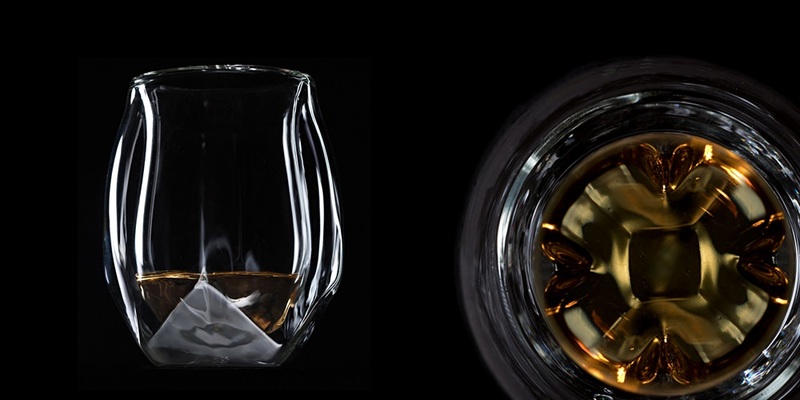 The Norlan glass delivers on both of these fronts with a comfortable, lightweight design that also aerates the whisky. The result? A smoother, more fragrant and flavorful sip without any volatility (or even the need to dilute it with water). When swirled, the fluid forms a standing wave (thanks to specially developed protrusions inside the glass) which increases the surface to air ratio and rate of oxidization, allowing the whisky to become more expressive. Pledge $38 to score a set of two glasses. One man's quest for affordable, quality underwear.